A new study from Corporate Visions of 400 B2B organizations found something that doesn’t really surprise me, but still has me SMH. This is disheartening, but certainly passes the smell test, as Forrester says that 80 percent of B2B digital budgets are spent on customer acquisition. 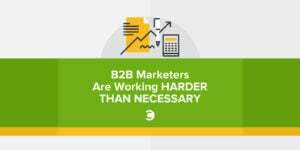 And maybe that’s just the way it has to be, as B2B marketing organizations are asked to consistently produce more and higher quality leads to satiate their thirsty companions over in the sales department. From the perspective of sales making their numbers, and marketing making their numbers (typically tied to sales like a string to a balloon), I guess it makes sense. But from the perspective of OVERALL company health, does it? The 80/20 Pareto Principle was first posited way back in 1906 by Italian economist Vilfredo Pareto, who discovered that 80 percent of the land in Italy was owned by 20 percent of the population. Subsequently, the 80/20 ratio has proven to be present in a great many circumstances, including revenue. Gartner Group determined that this ratio applies to most companies, with 80 percent of revenue coming from 20 percent of customers. Further, research from BIA/Kelsey and Manta in 2014 found that current customers spend 67 percent more than new customers, and are of course much less expensive to obtain (because you’ve already done so). This study was of small business, not necessarily B2B, but the thesis remains valid. B2B marketers find themselves caught between what they are being asked to do to satiate sales objectives, and what every piece of research (and common sense) has demonstrated to be true. In short, B2B marketers are robbing Peter (customer retention) to pay Paul (new customer acquisition). This is a Ponzi scheme of priorities, and will not end well. Now that B2B marketers have a staggering array of new technology at their disposal—enabling them to reach the right person, at the right time, with the right message, in the right format—the implications of this balance between acquisition and retention are even higher. I am an investor in multiple B2B marketing startups that are part of this ecosystem, including Uberflip, Captora, and Terminus (in the hot account-based marketing space). My hope is that these companies, their customers, and all B2B marketers muster the courage to look beyond the monthly and quarterly sales-qualified leads numbers that dangle over their collective necks like a guillotine, and instead spend some real brain power and marketing muscle on getting current customers to renew. The worst possible situation for marketers is to have to spend a ton of time and money to replace previous customers that didn’t renew. That is Treadmill Marketing—a recipe for running in place and slow (or no) growth. The best possible situation for marketers is to devote a meaningful share of time and money to ensure (in partnership with sales) that current customers remain as customers. In that scenario, all the new customers acquired represent growth, not replacement revenue. It’s been said again and again and again in business that what you measure is what you care about. But how you spend your marketing dollars is what you care about too, and most B2B companies are caring too much about acquisition, and not enough about retention.